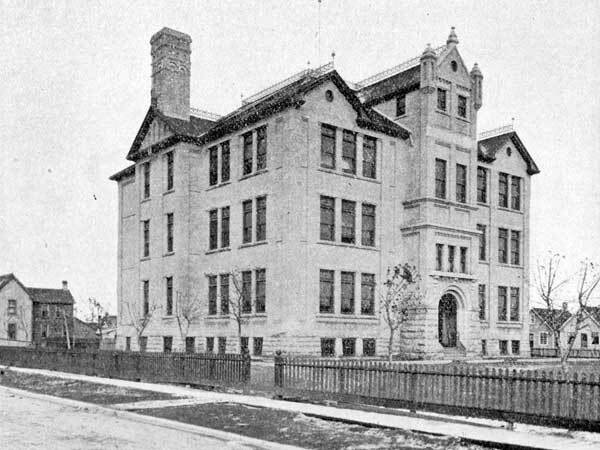 The first Pinkham School was designed by architect brothers C. A. Barber and E. W. Barber, and erected in 1883, at the intersection of Alexander Avenue and Rietta Street in Winnipeg. It was named for cleric William C. Pinkham, who had been Superintendent for Protestant Schools in Manitoba from 1872 to 1882. It was a two-storey, two-classrom structure, built of solid brick at a cost of $5,500. In 1903, Pinkham School No. 1 was demolished and a replacement, a three-storey brick structure designed by local school architect, J. B. Mitchell, took its place. A cornerstone for Pinkham School No. 2 was laid at a ceremony on 2 September 1903 where School Board Chairman D. A. Ross received a silver trowel from the ward’s trustee, G. A. Lister. Sealed inside the cornerstone was a box containing Canadian coins (1, 5, 10, 25, and 50 cent pieces), Canadian stamps (1, 2, 5, and 10 cent values), along with recent copies of the Manitoba Schools Act, Winnipeg Public School Board By-laws, Manitoba Free Press, Winnipeg Telegram, Winnipeg Tribune, a listing of officials (Imperial, Dominion, Provincial Legislative Assembly, and City of Winnipeg), along with the names of those contracted to build the school. Pinkham School No. 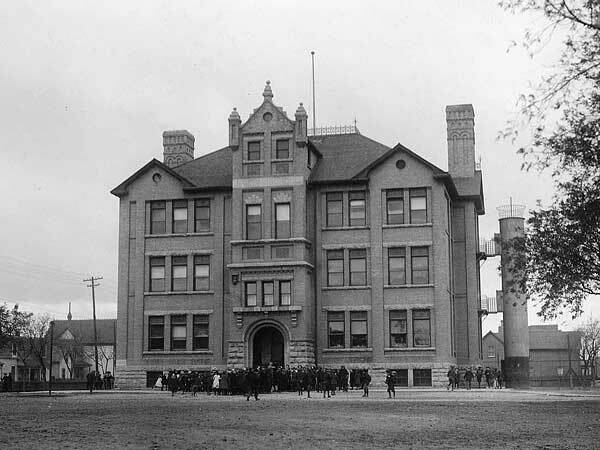 2 was severely damaged by a fire on 23 August 1945 and, while renovations were being done, students went to Dufferin School. This school was later demolished and replaced with the present structure at the site. Some noteworthy people who were students of Somerset School included Fred Grinke, Irene Grinke, Chrissie Shewchuk, Agnes Giesbrecht, Esther Cohen, Maurice Cohen, Les Lear, Martin Platz, Paul Platz, Allan Haynes, Percy Haynes, Hisbie Schiller, Bill Dumsday, Franklin Frederickson, Paul Bardal, and Dr. Clarence McCharles. Margaret E. “Maggie” Raleigh, ? Source: Winnipeg School Board, Annual Report 1905, Legislative Library of Manitoba. “Laid corner stone at Pinkham School,” Manitoba Free Press, 3 September 1903, page 7. Winnipeg School Board, Annual Report 1905, Legislative Library of Manitoba. “Present for Principal,” Manitoba Free Press, 26 May 1905, page 16. “Winnipeg schools, No. 7—Pinkham,” Manitoba Free Press, 23 October 1922, page 3. “Fire causes damage to Pinkham School,” Winnipeg Free Press, 24 August 1945, page 1. We thank the Winnipeg School Division and Mary (neé Nix) Gomide for providing additional information used here.